I stumbled upon this while printing a Freeze Reverb track of a synth arpeggio loop. I used Ambience by Magnus and Sandford Reverb for my freezes. Just 8 bars, kind of Minor and Diminished. I Extracted To Chord Track from the arp then Applied the Chords from Chord Track to the freeze. Turns a plain Reverb Freeze into a pad part. Set Follow Chords to Universal. Results can vary depending on the harmonic content of the Freeze. S1 has to lock onto something it can identify before it can transpose it. Last night I needed to lay down a keyboard part on a song and didn’t have much time. I created a chord track and just played away, paying attention only to the timing. The Chord Track fixed the wrong notes, but then I went in and overdubbed some additional phrases. It saved a lot of time, and I ended up with a part that really made me happy. 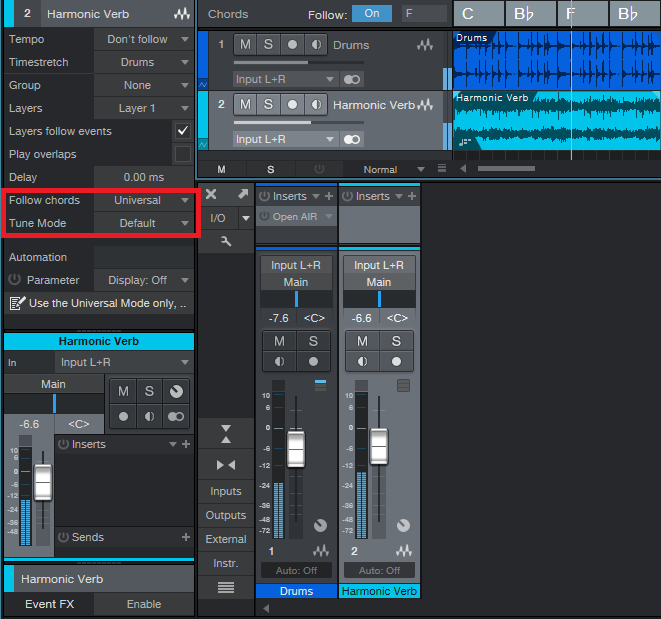 And don’t forget to try the Chord Track with drum loops – it’s freakishly cool.